We have had a fabulous couple of months celebrating our 60th Anniversary with our friends, supporters and formers. 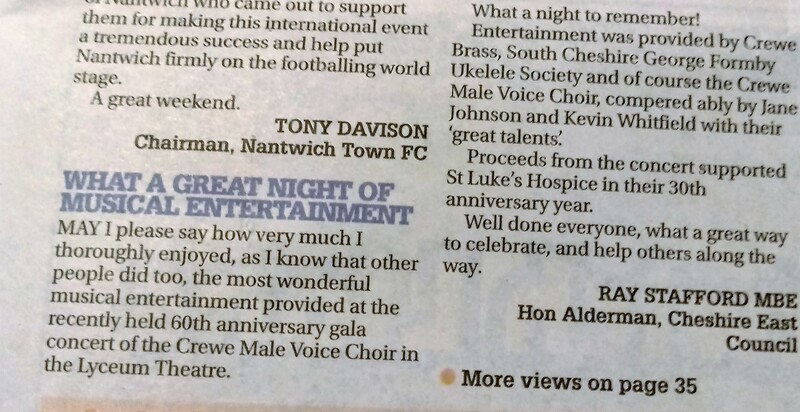 A formal reception was help on the 24th September in the Municipal Buildings of Crewe, the same spot where in February 1958 a meeting was held to inaugurate a ‘new male voice choir for Crewe and District’! In attendance were Mayor of Cheshire East, Cllr Lesley Smetham and consort Mr David Smetham, the Mayor of Crewe, Cllr Brian Roberts, the Mayor of Nantwich, Cllr David Marren and consort Mrs Belinda Marren and the Mayor of Sandbach Cllr Richard Hovey. The Choir then entertained their guests to an Evening of Music with songs from the earlier and current repertoires. Denise Leigh (soprano) and Stefan Andrusyschyn (accordion), who have performed with the Choir over many years, added their own delightful and unique blend of vocal and instrumental music. Denise joined the Choir for the final song, “You’ll Never Walk Alone”, sending a tingle down the spines of the audience. On the 15th October our celebrations came to a conclusion with the choir returning to the Lyceum Theatre for a Gala Concert with special guests Crewe Brass Band, Jane Johnson, Kevin Whitfield, Nadia James and the South Cheshire George Formby Ukulele Society.